Scientists see climate change. Credit: Lauren Sommer. Over the last 15 years, more than a billion dollars has been spent to protect Lake Tahoe’s clear waters from runoff and erosion. Now, new threats to lake’s clarity are emerging, just as restoration funding is drying up. Researchers from UC Davis are hot on the trail of one of those threats. On a recent late summer morning, Katie Webb and a team from UC Davis’s Tahoe Environmental Research Center went looking for it on a boat near South Lake Tahoe. “So what we’re looking for is a metal clam corral,” Webb says, pulling on her scuba gear. The “clam corral” is a wire basket that holds clams living on the lake bottom. Webb swims down to it and attaches a rope, so the team can pull it on board. The clams inside are Asian clams, an invasive species. They were not a welcome visitor when they were discovered in Lake Tahoe in 2002. Webb and her team are monitoring these corralled clams to see how fast the population is growing. “So you can see this individual is number 11,” she says, pointing to a tiny number super-glued on its shell. They use the numbers to track individuals over time. “We can see how much they’ve grown since we checked them in February and it should be a lot. They grow a lot in the summertime,” Webb says. “What they do is somewhat disturbing,” says Geoff Schladow, director of the Tahoe Environmental Research Center. 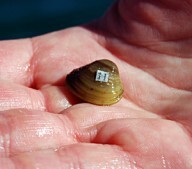 Asian clams filter massive amounts of lake water and that’s where the problem starts. “Of everything they filter, they consume about 10 percent of it and 90 percent they excrete. So their excretions are like these huge nutrient bombs,” Schladow says. With thousands of clams per square meter in some parts of the lake, their “nutrient bombs” help create algae blooms. “So you have this bright green, stringy algae, sort of clinging to the bottom, a few tens of yards from the beach. People would be astounded to see this cause it looks like any place but Tahoe,” he says. In the face of this invasion, a team from UC Davis has been experimenting with rubber mats that suffocate Asian clams on the lake bottom. So far, the treatment looks promising. 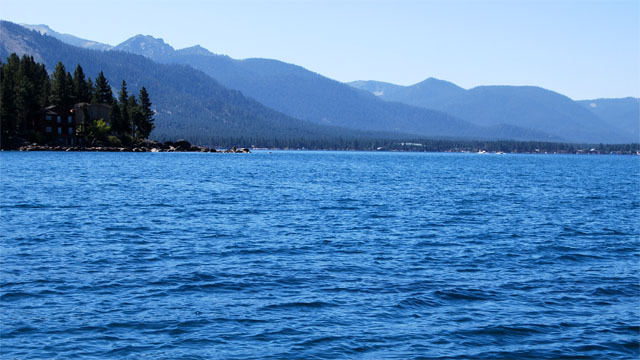 Keeping the lake blue – and not green – has been a rallying cry for both environmental groups and Tahoe’s tourism industry. Forty years ago, scientists could see 100 feet into the lake. Today, the clarity has decreased significantly to 64 feet. “We’re essentially like a bowl and what happens on the land affects the water,” says Julie Regan of the Tahoe Regional Planning Agency. The agency oversees development on both the California and Nevada sides. “What happened on the land in the 50s, 60s and 70s is that we had a lot of development – rampant overdevelopment,” she says. Tahoe hosted 1960 Winter Olympics at Squaw Valley. Casinos went up. Building was booming. And soon, the region had a runoff problem. “It’s driveways. It’s houses. What you cover on the land then interferes with the soils ability to filter runoff. That’s what’s causing clarity loss,” says Regan. Over the past 15 years, local agencies have tried to stop this decline with $1.5 billion of federal, state and local money. They’ve preserved open space and built projects to control erosion and filter runoff. “In 2008 we got the news from the scientific community that we had stopped the slide and decline of lake clarity. That was great news,” says Regan. In 2010, however, researchers at UC Davis found the second worst clarity level ever recorded. Geoff Schladow says runoff isn’t the only culprit. “What we’ve had just in the last few years is this explosion, this large increase in algae and they seem to be concentrated right near the surface,” says Schladow. These algae are invisible to the eye, but they’re the right size to make the water look cloudier. Normally, they’re competing with large algae near the surface. But Schladow says that’s changing. Algae are heavier than water, so they gradually sink. Recently, the lake hasn’t been mixing as much. The reason, Schladow thinks, is that the surface waters of the lake have gotten warmer with climate change. Warmer water is lighter than the cold, dense water at the bottom of the lake. So it’s little bit like oil and water. The layers of the lake are more resistant to mixing. “Now when we have less mixing, the large algae sink out. All we’re left with are the small ones. And so their numbers are going up,” says Schladow. 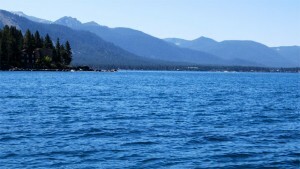 After decades of conservation work to reduce runoff, a lot of people are disappointed to see climate change posing a new threat to Lake Tahoe’s clarity. After an unprecedented influx of restoration funding, resources are now running low. Senator Dianne Feinstein introduced the Lake Tahoe Restoration Act of 2011 in Congress to authorize more, but has said she’s not optimistic about getting it passed. “We know the funding picture could potentially be bleak, so we’re looking to any strategy that we can to keep this momentum going in terms of restoration,” says Julie Regan of TRPA. On top of that, Nevada is threatening to end its forty-year partnership with California by pulling out of the Tahoe Regional Planning Agency, unless concessions are made about its voting power on new development. Regan says it’s just one more challenge that will make the next few years a critical time for Lake Tahoe’s future. Try to read this if interested . . . .
How Climate Change my bring a cloudy future to Lake Tahoe.